To make an educated guess, it is probably best to acknowledge that Mueller, above all else, is a politically compliant creature, someone to whom national security always takes a back seat to political concerns. To get started on the corroborating evidence, see Rep, Louie Gohmert’s extensive brief, “Robert Mueller, Unmasked” here, and my own separate compilation, “Mueller’s FBI” here. The man who really got Mueller’s number earliest on (“Eric Holder’s gift to Justice”), however, is the late William Safire, as discussed, for example, here. 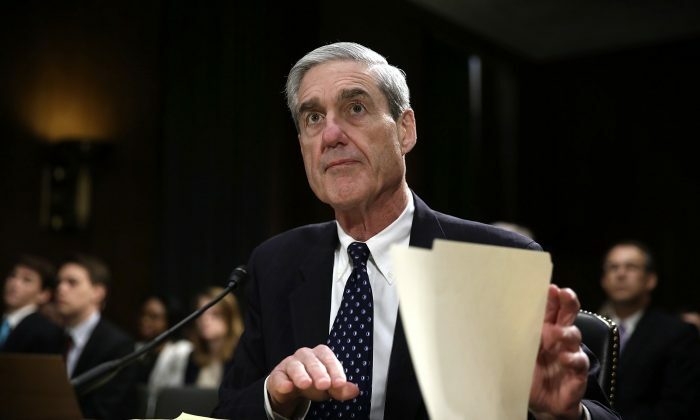 From long-forgotten “Iraqgate,” to 9/11 and after, Mueller’s career-mission has been to guard and protect the Deep State. In our own time, take the FBI counter-intelligence operation known as “Ghost Stories,” which for ten years was tracking a covert ring of deep-cover Russian intelligence operatives known as “illegals.” One day in June, 2010, when Obama was president and Mueller was FBI Director, this ring was rolled up and abruptly deported back to Mother Russia. Indeed, Hillary Clinton “worked feverishly” to get these Russian agents deported before they could be adequately debriefed or otherwise exploited, as J. Michael Waller has written about the case. Remember, June 2010 was a busy month for Bill and Hillary Clinton, President Obama, and the Russians: Rosatom was initiating its purchase of Uranium One; Bill Clinton was pocketing $500,000 from that KGB-linked Moscow bank, Renaissance Capital, which was “talking up” Uranium One shares (even as $145 million was sloshing into the Clinton Foundation), while President Obama was pushing for Russian membership in the World Trade Organization. Who needed secret Russian agents running around when everything was going so well for the Kremlin? They had to go and they went. And FBI Director Mueller? Was he in a lather over this particularly egregious form of Russian “meddling,” or “influence” on the Obama administration? Last time I looked, he did not resign from his FBI directorship in protest of any of it. Maybe he was too busy himself hiding evidence from Congress of the so-called Mikerin probe, the investigation into a Russian bribery scheme to control an American uranium trucking firm, even as U.S. lawmakers were examining the proposed sale of Uranium One to the Russian government. In fact, in FBI Director Mueller’s 2010 treatment of the Russian espionage ring we see a funhouse-mirror-image of Special Counsel Mueller’s Russian “hacking” indictments in 2018. In 2010, without a single indictment or anything comparable, Mueller’s FBI did its part in deporting from American soil a network of high-value Kremlin intelligence operatives for political reasons; in 2018, without any expectation of prosecution—and, according to a formidable group of intelligence community whistleblowers led by former NSA tech director William Binney, without credible evidence—Mueller’s Special Counsel office indicted a bunch of random Russian intelligence officers, also for political reasons. Things didn’t go as planned. It is 2019 and Trump is still standing tall, despite the vicious and toxic attacks of the past several years. The anti-Trump conspiracy is in tactical retreat, concentrating its forces to protect itself as it regroups. That is the hidden message of the Mueller Report: Its long overdue “exoneration” is a shiny distraction; its doubling-down on the phony Russian hacking story is where our eyes should fall. What I think is unfolding is that Mueller et. al. are tacking back to the core mission: protecting the Deep State from exposure for its role in a criminal conspiracy to overturn an election.